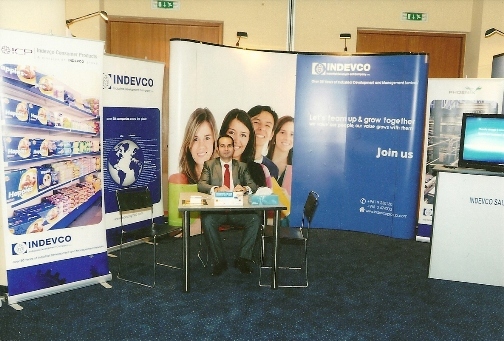 INDEVCO Group HR Recruitment Unit met with attendees of the Engineering Job Fair 2011 at Stand #42. The Engineering Job Fair took place on 3 - 4 November 2011 at the Palais des Congres in Dbayeh, Lebanon. INDEVCO Group representatives were available at Stand # 42 to accept CV’s and meet potential applicants for any inquiries. At the Engineering Job Fair 2011, Neemat Frem, President & CEO of INDEVCO Group and President of the Association of Lebanese Industrialists (ALI), spoke at the Opening Ceremony. Additionally on the first day, Amal Musallam, an INDEVCO Executive Director, presented a seminar discussing an overview of INDEVCO Group operations. INDEVCO, international manufacturing group headquartered in Lebanon, produces paper and plastic flexible packaging, corrugated containers and displays, and consumer tissue and institutional disposables. INDEVCO is the managing partner of Napco, based in the Kingdom of Saudi Arabia. Napco, a leading Middle Eastern group of manufacturing companies, employs over 3000 employees. The group employs over 8500 people in Cyprus, Egypt, England, France, Greece, Lebanon, Saudi Arabia, Sweden, Sudan, Ukraine, and the United States.